The Volvo XC90 is a mid-size luxury crossover SUV manufactured and marketed by Volvo Cars since 2002 and now in its second generation. The first generation was introduced at the 2002 North American International Auto Show and used the Volvo P2 platform shared with the first generation Volvo S80 and other large Volvo cars. It was manufactured at Volvo's Torslandaverken. Volvo moved production equipment of the first generation to China and ended Swedish production at the end of 2014, renaming the car as the Volvo XC Classic (or Volvo XC90 Classic). At the end of 2014, the second generation XC90 was introduced. It is based on a new global platform, called Scalable Product Architecture or SPA for short. Both generations of the XC90 have won Motor Trend's SUV of the Year award in their debuts. In January 2001, Volvo débuted its Adventure Concept Car at the North American International Auto Show, to gauge reaction to the styling and features of its upcoming SUV. In November 2001, Volvo released a teaser image showing the frontal styling of the production version, named the XC90. Notable as Volvo's first SUV model, the styling of the XC90 recalled the concept. In January 2002, the full XC90 unveiling occurred, at the North American International Auto Show. Production began in August 2002, after Volvo's traditional mid-year shutdown, with the first XC90s coming out of the Torslanda factory in Sweden. At its North American launch for the 2003 model year, the XC90 was presented with a choice of two trim levels, the 2.5 T and the T6. The 2.5 T was the entry level version and offered a 2.5-litre B5254T2 "T5" turbocharged inline-five engine, producing 208 hp (155 kW) and 236 lb⋅ft (320 N⋅m) mated to an Aisin co-developed five-speed AW55-50/51 automatic. The T6 offered a 2.9-litre B6294T twin-turbocharged inline-six with 268 hp (200 kW) and 280 lb⋅ft (380 N⋅m) mated to a GM-sourced, Volvo-modified four-speed 4T65EV/GT automatic. While the 2.5T came standard with front-wheel drive, a Haldex Traction all-wheel drive (AWD) system was optional. The T6 was offered only with the AWD system. A Yamaha V8 engine was added in 2005. This 4.4-litre Volvo B8444S engine produced 288 hp (215 kW) for the first few models later upgraded to 311 hp (232 kW) and 325 lb⋅ft (441 N⋅m) of torque. Volvo sold just over 40,000 XC90 units in North America that year. The XC90 won the North American Car of the Year award and Motor Trend magazine's Sport/Utility of the Year for 2003. The ex-host of Top Gear, Jeremy Clarkson, has owned three of these vehicles, and claims they were designed by someone who must've had children due to its practicality. The XC90 was updated for 2007 with a restyled front and rear and a revised interior. The 235 hp (175 kW; 238 PS) 3.2 L SI6 straight-6 engine replaced the 208 hp (155 kW; 211 PS) B524T2 straight-5 in the base model for the US market. The 2007 XC90 debuted in April 2006 at the New York Auto Show. For model year (MY) 2009, the XC90 received a new rear logo, featuring larger lettering with wider spaces between the "VOLVO" letters. In 2010, all XC90 models received painted wheel arches (previously they were optional). In addition, a new, larger, circular Volvo logo appeared on the front grille. For MY 2012, new LED tail-lights became available on certain models, although entry-level models retain the previous style. For MY 2013, the XC90 received a cosmetic refresh that included standard LED daytime running lights and taillights, and exterior revisions including body colour bumpers, rocker panels and silver trim replacing black plastic trim. The refreshed model went on sale during late spring 2012 with a base price of US$40,395 for a front-wheel drive base model. For the 2014 model year the base price is US$39,700. In early 2005 a special version called Ocean Race Edition was unveiled. Special blue colour, leather interior with contrast stitching and special interior trim. A total of 800 were made. The first generation Volvo XC90 continues to be sold in China as the XC Classic. It is being produced at the new Volvo factory located in Daqing, Heilongjiang Province, with the necessary tooling shipped over from Sweden. Equipment levels were changed compared to the international versions and only one engine, a 2.5L turbo petrol 5-cylinder engine with 220 hp, is available. All XC Classic come with AWD as standard and either a 5-speed manual or 5-speed automatic transmission. It is priced below the second generation XC90. The Volvo XC90's front end is designed to absorb frontal impacts and also deflect any pedestrians up on to the hood of the vehicle rather than underneath the vehicle. Volvo has patented the unique frontal structure that features crumple zones, and predetermined positions for the engine and other ancillaries during a frontal impact. The XC90's roof is reinforced with ultra-high-strength steel to help prevent a collapse in the passenger cavity in the event of a roll-over. This Volvo system is marketed as ROPS, and is closely associated with the Roll Stability Control (RSC), electronic stability control (DSTC), and SIPS systems of Volvo to prevent and ultimately minimise accident forces. The National Highway Traffic Safety Administration measures the roll-over risk of the 2013 XC90 as 17.9%. The max. sideway thrust is 0.77g. The XC90's rear structure has been designed to absorb impact energy, with occupants are also protected by a whiplash protection system. Marketed as WHIPS, the system cradles the occupants during a rear-end collision. The Insurance Institute for Highway Safety awarded the Volvo XC90 their Top Safety Pick award. The XC90 was granted the IIHS's rating of "good" in front, side, rear and roof strength tests and has Electronic Stability Control as standard equipment to receive the award. The industry-first Roll Stability Control was first introduced in XC90 in 2003. At the end of July 2007, Volvo Car Corp. announced the recall of 42,211 2005 model year XC90s for risk of battery short circuit and fire. The vehicles were manufactured in the Swedish Torslanda Plant between 7 June 2004, and 13 May 2005. The recall only applies to cars in the US and Canada. There have been no reports of short circuiting in the vehicles. 3 seat/head restraint geometry rated "Good"
In May 2012 Volvo announced that the second generation XC90 would go into production in late 2014, with orders being taken in 2014 and the vehicle officially going on sale in 2015. The SUV would be sold in Europe, Asia and North America, with the United States expected to account for at least a third of global sales. The present generation XC90 is based on Volvo's new platform, marketed as Scalable Product Architecture (SPA) technology which features a stronger platform offering weight reduction while improving safety and efficiency. The vehicle is longer, wider and lower than its predecessor. All engines in the XC90 will be 2.0-litre four-cylinder Drive-E powertrains with Volvo's eight-speed Geartronic transmission. The line-up will include two petrol engines: a twincharged 320 hp T6, producing 400 nm of torque and a turbocharged 254 hp T5, producing 350 nm of torque, two diesel engines: a twin turbo 235 hp D5, producing 470 nm of torque and a turbocharged 190 hp D4, producing 400 nm of torque. The top-of-the-line model is the XC90 Twin Engine, a plug-in hybrid which combines the more powerful petrol engine at the front with an electric motor at the rear to produce 400 hp and 640 nm of torque. The First Edition of the all-new Volvo XC90, 1,927 individually numbered cars only available for sale via digital commerce, sold out in 47 hours after orders opened on 3 September 2014. All 1,927 of the First Edition models, which could feature either the Petrol T6 or Diesel D5 engine, were finished in Onyx Black and feature 21-inch alloy wheels and include every available vehicle option. The limited production run number represents the year the Swedish brand was launched, with each model fitted with uniquely numbered tread plates and a distinctive rear mounted badge, with customers able to select their XC90 First Edition numbers. Number 1 was allocated to Carl XVI Gustav, the King of Sweden, with number 10 going to Zlatan Ibrahimović, Swedish professional footballer. The new XC90 has a redesigned chassis with double wishbone front suspension and a new integral link rear axle incorporating transverse leaf springs of lightweight material. The new XC90 can also be equipped with electronically controlled air suspension with a choice of five modes. The interior features a 9" tablet-like touch screen control console along with steering wheel controls and voice-control system, all linked to an interface, marketed as Sensus, which allows for access to cloud-based apps including Internet radio, connected navigation, parking, music streaming, OS mirroring Apple and Android devices in the touch screen display, and a Wi-Fi hot spot for using a tablet in the car. Other features include a gear lever made of Orrefors crystal as well as diamond-cut controls for the start/stop button and drive mode control, located on the centre console between the driver and passenger seats. The highest level audio system in the XC90 features a 1400W Class-D amplifier and 19 Bowers & Wilkins speakers as well as one of the first air-ventilated subwoofers in a car. Integrated into the car body, it turns the entire interior space into a large subwoofer. The latest sound processing software has been used to manage the timing of the sound and co-ordination of the speakers. The vehicle's seats have also been redesigned with adjustable side bolsters, seat cushion extension and massage. The second row features three individual seats with recline adjustment. A sliding function can be used to create more legroom for the passengers in the third row or to increase loading space. An integrated child booster cushion in the centre seat is available. The Volvo XC90 seats 5 people or can be available with 3rd row seating which seats 7 people. Volvo Cars' air purification system has been improved by adding a new carbon filter for more efficient capture of small, particles and pollen in the incoming air. The second generation XC90 offers a 360° view system capable of providing the driver with a birds-eye view, whereby information from all cameras is gathered and digitally integrated in a central processor to form a 360° image. The rear sensing system, marketed as Park Assist Pilot, offers automatic reversing into a parking bay. The 2nd generation XC90 is the first Volvo to carry the company's new, more prominent iron mark, which has the iconic arrow aligned with the diagonal metallic slash across the grille, along with T-shaped LED daytime running lights known as "Thor's Hammer" by Volvo designers. The car will be available in five trim levels (Volvo describing it as "expressions"), namely Kinetic (base trim level), Momentum, Inscription (a more luxurious trim), R-design (a sportier trim) and Excellence (ultra-luxury). The Second Generation Volvo XC90 SUV feature (IntelliSafe), including Run-off-road protection package and Auto brake at intersection. Run-off-road protection package. In a run-off-road scenario, the all-new Volvo XC90 detects what is happening and the front safety belts are tightened to keep the occupants in position. To help prevent Spinal cord injury, energy-absorbing functionality between the seat and seat frame cushions the vertical forces that can arise when the car encounters a hard landing in the terrain. City Safety with auto brake in intersections. The XC90 is the first car in the world with technology that features automatic braking if the driver turns in front of an oncoming car. This is a common scenario at busy city crossings as well as on highways, where the speed limits are higher. IntelliSafe with City Safety has become the umbrella name for all of Volvo Cars' auto brake Collision avoidance functions, which are standard equipment in the new XC90. This equipment now covers vehicles, cyclists and pedestrians in front of the car during both day and night. Adaptive Cruise Control with Pilot Assist traffic jam assistant enables safe and comfortable semi-autonomous driving by automatically following the vehicle ahead in stop-and-go traffic. Acceleration, braking and now also steering are controlled automatically. On March 18, 2018, a woman called Elaine Herzberg was killed by the Uber Volvo XC90 while the vehicle was running the Uber's own vehicle control hardware and software self-drive mode, Uber's XC90's do not include any of Volvo's own advanced driver-assistance systems. (See Death of Elaine Herzberg). The Volvo brand has also made the claim that "By 2020, nobody shall be seriously injured or killed in a new Volvo." EURONCAP tested in 2015 a XC90 (model year 2016), 5-door SUV with standard equipment. EuroNCAP regards the XC90 model as a "best in class" performer. NHTSA currently only recorded for rollover. With over 50,000 vehicles sold in the U.K. by 2018, no driver or passenger fatality had been recorded. Volvo XC90 T8 plug-in hybrid. The T8 plug-in hybrid version of the XC90 is based on technology used in the Volvo V60 PHEV. The batteries are situated at the centre of the vehicle can be charged using an electric vehicle charger and can also store energy recovered by means of regenerative brakes. Volvo says that the XC90 T8 sacrifices no passenger or cargo space to accommodate the hybrid equipment. However, the tank capacity was reduced to 50 L (13.2 US gal; 11.0 imp gal) for MY2016-2018 and there is no spare tire. The vehicle emits 49 g/km of CO2 and has an all-electric range of 43 km (27 mi) under the New European Driving Cycle. Normal driving is conducted in the default hybrid mode, but the driver can push a button to switch to a mode that uses only electric power, with zero emission driving. Under the U.S. Environmental Protection Agency (EPA) tests, the XC90 T8 has an all-electric range of 14 mi (23 km), with some gasoline consumption (0.1 gal/100 mi), so the actual all-electric range is rated between 0 to 13 mi (0 to 21 km). The EPA, under its five-cycle tests, rated the 2016 model year XC90 T8 energy consumption in all-electric mode at 58 kWh per 100 miles, which translates into a combined city/highway fuel economy of 53 miles per gallon gasoline equivalent (MPG-e) (4.4 L/100 km; 64 mpg-imp gasoline equivalent). When powered only by the gasoline engine, EPA's official combined city/highway fuel economy is 25 mpg‑US (9.4 L/100 km; 30 mpg‑imp). Deliveries of the XC90 T8 PHEV began in the United States in August 2015. Sales in Europe totaled 2,653 units in 2015. Cumulative sales in the U.S. totaled 488 units up until February 2016. According to Volvo, sales of the plug-in variant represent 20% of Volvo XC90 global sales by mid-March 2016. ^ Padeanu, Adrian (11 September 2014). "First generation Volvo XC90 to live on in China as XC Classic". www.motor1.com. Retrieved 29 January 2016. ^ "XC Classic picture" (JPG) (in Chinese). Volvo Cars China. Archived from the original on 6 January 2018. Retrieved 6 January 2018. ^ "International - Volvo Cars". Archived from the original on 22 February 2015. Retrieved 19 June 2015. ^ "Frasher's odyssey: With the design of its XC90 SUV, Volvo had to navigate between the scylla of me-too trucky styling and the charybdis of station wagon wimpiness. (Design)". 2002. Retrieved 19 June 2015. ^ "2003 Volvo XC90 owner's manual". new.volvocars.com. Volvo Car Corporation. 2002. p. 151. Retrieved 19 September 2015. ^ "2007 Volvo XC90 owner's manual". new.volvocars.com. Volvo Car Corporation. 2006. p. 209. Retrieved 19 September 2015. ^ Pund, Dan (January 2001). "Volvo Adventure Concept Car". Car and Driver. Retrieved 15 July 2012. ^ a b c Lacy, Justin (29 November 2001). "First pics: Volvo joins the off-road boom". www.goauto.com.au. John Mellor Pty Ltd. Archived from the original on 30 July 2017. Retrieved 15 July 2012. ^ "Volvo XC90 Leads Sales With Best Month of the Year". Thefreelibrary. 4 January 2006. Retrieved 21 January 2012. ^ "20 years of Clarkson: What cars does Clarkson actually drive?". Driving.co.uk. 14 March 2014. Retrieved 19 September 2015. ^ "2013 Volvo XC90 Photos and Info-Car News-Car and Driver". Car and Driver. 3 May 2012. ^ "Volvo XC90 Price". NADAguides. ^ "Volvo Introduces Special Volvo Ocean Race Edition - Three Models with Unique Ocean Blue Livery" (Press release). 13 February 2005. Retrieved 19 September 2015 – via swedespeed. ^ "Mild curio Dad wagon - V8 Volvo Xc90 Volvo Ocean Race". PistonHeads. 25 March 2016. Retrieved 7 January 2017. ^ "沃尔沃XC CLASSIC豪华SUV-Volvo XC CLASSIC报价, 配置, 参数-沃尔沃Volvo中国官方网站" [Volvo XC CLASSIC - Volvo luxury SUV: The XC Classic, offers, configurations, specifications]. www.volvocars.com/zh-cn (in English and Chinese). Volvo Car Corporation. Archived from the original on 6 September 2015. Retrieved 19 September 2015. ^ a b "Volvo XC Classic hits the Chinese car market". Car News China. 16 September 2014. Retrieved 19 September 2015. ^ "First generation Volvo XC90 to live on in China as XC Classic". www.worldcarfans.com. Retrieved 19 June 2015. ^ Adrian Padeanu (11 September 2014). "First generation Volvo XC90 to live on in China as XC Classic". www.motor1.com. Retrieved 19 September 2015. ^ "Spy Shots: Volvo XC Classic testing in China". www.carnewschina.com. 30 June 2014. Retrieved 19 September 2015. ^ "Volvo XC90 Betriebsanleitung" [Volvo XC90 Owners Manual] (PDF) (in German). Volvo Car Corporation. 2008. Retrieved 9 January 2017. ^ "Volvo Betriebsanleitung XC90 MY06" [Volvo XC90 Owner's Manual MY06] (PDF) (in German). Volvo Car Corporation. 2006. Retrieved 9 January 2017. ^ "XC90 Betriebsanleitung MY13" [XC90 Owner's Manual MY13] (PDF) (in German). Volvo Car Corporation. 2012. Retrieved 9 January 2017. ^ Vanderwerp, Dave (December 2016). "Volvo XC90". Car and Driver. US. Retrieved 9 January 2017. ^ "XC90 IIHS evaluation". Insurance Institute for Highway Safety. Archived from the original on 20 September 2010. Retrieved 9 October 2010. ^ Mike Monticello (1 December 2002). "2003 Volvo XC90 AWD T6 - Road Test". Road & Track. Archived from the original on 13 March 2011. Retrieved 9 October 2010. ^ "2003 Volvo XC90 – North American Truck of the Year". www.carpictures.com. 5 January 2003. Archived from the original on 2 January 2013. Retrieved 9 October 2010. ^ "Volvo recalls SUVs due to fire risk". Bloomberg News / The Arizona Republic. 25 July 2007. Retrieved 27 July 2007. ^ "Volvo to recall 42,000 cars in North America because of short circuit risk". International Herald Tribune. 29 March 2009. Retrieved 9 October 2010. ^ "2017 Volvo XC90 IIHS rating". www.iihs.org. Insurance Institute for Highway Safety. Retrieved 9 January 2017. ^ a b Owen Mildenhall (2 October 2014). "New 2015 Volvo XC90 revealed in Paris: pics, specs, video and full details". Auto Express. Retrieved 5 November 2014. ^ Nishant Parekh (10 October 2017). "Volvo begins assembly operations in India with XC90". www.autocarindia.com. Autocar India. Retrieved 24 July 2018. ^ "All-new XC90 will be the first Volvo built on the company's new Scalable Product Architecture". www.media.volvocars.com. Volvo Cars of North America. 12 August 2014. Retrieved 14 November 2014. ^ Viknesh Vijayenthiran (14 March 2013). "Bentley Interior Design Chief Robin Page Heads To Volvo". www.motorauthority.com. Retrieved 14 November 2014. ^ Mihnea Radu (14 April 2015). "Volvo unveils XC90 Excellence 4-Seat luxury SUV for Chinese Market". www.autoevolution.com. Retrieved 21 July 2017. ^ Fogelson, Jason. "2016 Volvo XC90 Test Drive And Review: Refining The SUV". Forbes. ^ "2016 Volvo XC90 Interior - U.S. News Best Cars". ^ a b c d e f "All-New XC90 - Technical Data". media.volvocars.com. Volvo Car Corporation. Archived from the original on 6 September 2015. Retrieved 21 July 2017. ^ Jay Ramey (27 April 2015). "Flagship Premiere". Autoweek. 65 (8): 16–17. ^ Kurylko, Diana T. (14 May 2012). "Volvo's goal: Conquest more luxury-vehicle buyers". Automotive News. ^ a b Ewing, Jack (26 August 2014). "Volvo Introduces Its First S.U.V. Made Under Chinese Ownership". The New York Times. Retrieved 26 August 2014. 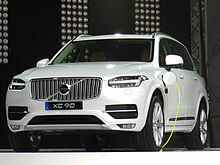 ^ a b "New Plug-in Hybrid Volvo XC90 Boasts 400 Horsepower". www.autotrader.com. Retrieved 5 November 2014. ^ a b c d e f g "The all-new Volvo XC90". www.media.volvocars.com. Volvo Car Corporation. 21 October 2014. Archived from the original on 18 October 2014. Retrieved 5 November 2014. ^ "Brand New: New Logo for Volvo by Stockholm Design Lab". www.underconsideration.com. 29 August 2014. Retrieved 8 September 2018. ^ "2015 Volvo XC90 teaser shows the 'Thor's Hammer' daytime running lights". www.indianautosblog.com. 12 August 2014. Retrieved 8 September 2018. ^ Joshua Dowling (27 August 2014). "World's safest soccer mum car". www.news.com.au. Retrieved 19 September 2015. ^ Joshua Dowling (3 August 2015). "World's safest family SUV, the new Volvo XC90, goes on sale in Australia today". www.news.com.au. Retrieved 19 September 2015. ^ "XC90 features integrated radar and camera system". ae-plus.com. 6 October 2014. Archived from the original on 1 February 2016. Retrieved 19 September 2015. ^ Daisuke Wakabayashi (23 March 2018). "Uber's Self-Driving Cars Were Struggling Before Arizona Crash". The New York Times. ISSN 0362-4331. Retrieved 29 April 2018. ^ "How 5000 Aussie lives will be saved". www.news.com.au. Retrieved 10 August 2015. ^ "Euro NCAP Reveals Latest Ratings for 2015". Euro NCAP. 13 January 2016. Retrieved 8 January 2017. ^ "2014 Volvo XC90 SUV AWD". U.S. Department of Transportation. Retrieved 30 September 2015. ^ "2016 Volvo XC90 Midsize luxury SUV Ratings". www.iihs.org. IIHS. Retrieved 30 September 2015. ^ "2016 Volvo XC90 T8 Twin Engine Specifications". www.volvocars.com. Volvo Car Corporation. Retrieved 28 May 2016. ^ "Volvo XC90 T8 Twin Engine in a class of its own at 49 g/km CO2" (Press release). Volvo Car Corporation. 30 April 2015. Retrieved 20 March 2016. ^ a b "2016 Volvo XC90 AWD PHEV". Fueleconomy.gov. [U.S. Environmental Protection Agency]] and U.S. Department of Energy. 18 March 2016. Retrieved 18 March 2016. ^ Cobb, Jeff (2 September 2015). "August 2015 Dashboard". HybridCars.com and Baum & Associates. Retrieved 4 September 2015. ^ Jose Pontes (30 January 2016). "Europe December 2015". www.evsales.com. Retrieved 20 March 2016. ^ Cobb, Jeff (6 January 2016). "December 2015 Dashboard". HybridCars.com and Baum & Associates. Retrieved 20 March 2016. A total of 86 units of the Volvo XC90 T8 plug-in hybrid were sold in the U.S. in 2015. ^ Cobb, Jeff (2 March 2016). "February 2016 Dashboard". HybridCars.com and Baum & Associates. Retrieved 20 March 2016. A total of 402 units of the Volvo XC90 T8 plug-in hybrid were sold in the U.S. in 2015. ^ Danny King (15 March 2016). "Volvo wants global, standardized charging infrastructure". Autoblog.com. Retrieved 20 March 2016. See press release. ^ "2016 Yahoo Autos Tech Ride of the Year: Apple, Android And Volvo". Yahoo!. Retrieved 17 November 2015. ^ "2016 Yahoo Autos Ride of the Year: Volvo XC90". Yahoo!. Retrieved 18 November 2015. ^ "Honda, Volvo top awards at Detroit show". Yahoo!. 12 January 2016. Retrieved 13 January 2016. ^ "Volvo XC90 Inscription-D5 review - NRMA 2015 Australia's best cars winner AWD SUV $65,000-$125,000". australiasbestcars.com.au. Retrieved 25 February 2016. ^ "2016 SA Car of the Year: And the winner is..." News24. 8 March 2016. Retrieved 9 March 2016. Wikimedia Commons has media related to Volvo XC90.